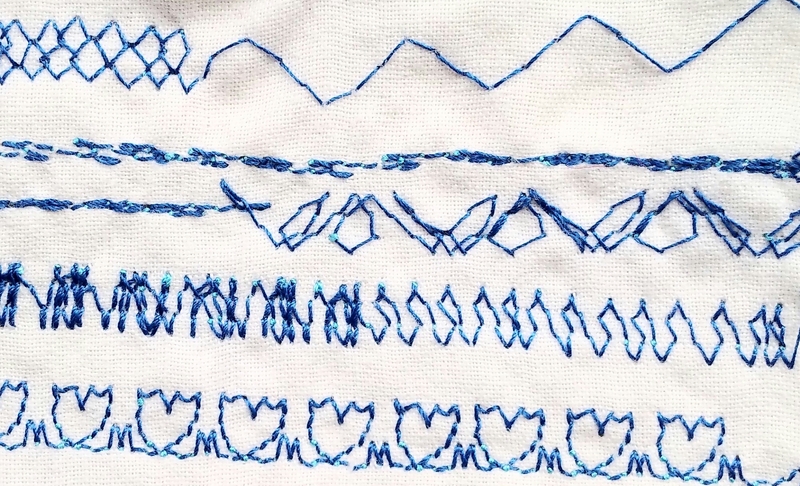 How does a sewing machine produce fancy stitches? It’s a combination of stitch length, zig-zag, needle position and reverse feed, and every fancy stitch can be reproduced manually, although it can be a very tedious process. The only problem with this method, is that you’ll need a third hand to guide the material while your other two hands are busy twiddling the knobs! Which is why automatic switching with cams is so much better! 🙂 Modern machines have this bit computerised, but the movement still remains the same, only now instead of cams, we use motors and actuators. 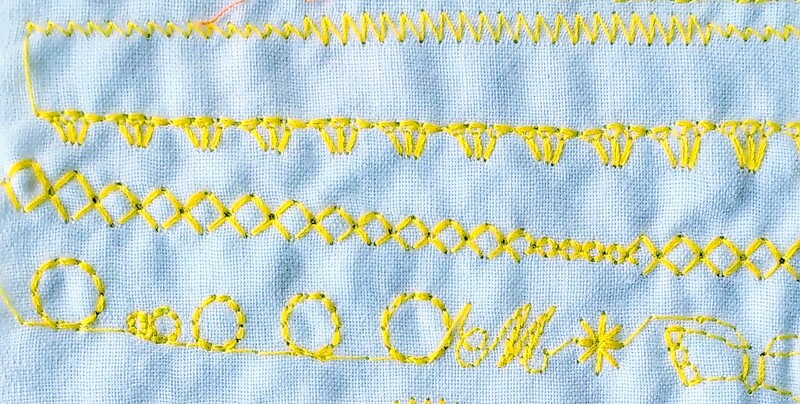 These stitches produce filled shapes. The machine keeps stitching in zig-zag, and the cam makes it change zig-zag width in a certain pattern. Changing needle position makes the pattern have a left or right straight edge, or be centred, as for example on New Home 509 shown above, or on my New Home 580. The cams for this mechanism are rounded – the width of the “collar” represents the zig-zag width. The cam collar changes the zig-zag width between minimum and maximum, so where the collar is smallest, you get straight stitch sewn at the currently set needle position. This is how pattern 11R in the table above gets its straight bits. 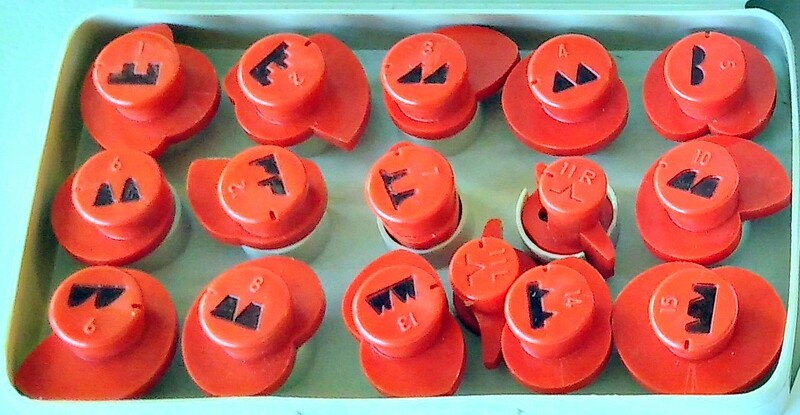 The note under the table says that it only works with the needle set to the right, so what happens in other needle positions? The straight bits are moved to where the needle is set, but the zig-zag is always going left, so it is getting smaller and smaller and blends completely into the straight stitch when the needle is set left. There is also an 11L cam that does the opposite, so only works properly with the needle set left. Here are the two No.11 cams (yes, they have miraculously changed colour). The left one will produce deeper zig-zag spikes because the “arms” are longer. Notice the position of the start mark – a white tick on the top of the cam. These marks correspond to a positioning pin in the mechanism, so that the pattern always starts in the zig-zag left position. The “arms” in the 11L and 11R cams are displaced with respect to those marks, and that’s how the machine knows when to zig-zag. These patterns are sewn with the zig-zag width lever set to zero, it controls the minimum zig-zag width in the pattern. Increasing zig-zag width with the lever, changes straight bits into zig-zag ones. This also allows to do blind hemming and overedging in one operation (good for lightweight fabrics), and make picot hems. But zig-zag is also a sort of fancy stitch produced from straight stitch by changing the needle position, someone figured. So it can be done with a cam! And then we can make wiggly curves too, because such a cam system would be able to position the needle freely for every stitch. This idea proved very popular, both with interchangeable and built-in cams, I am not sure who invented it first. Singer started using it in their 300 series. 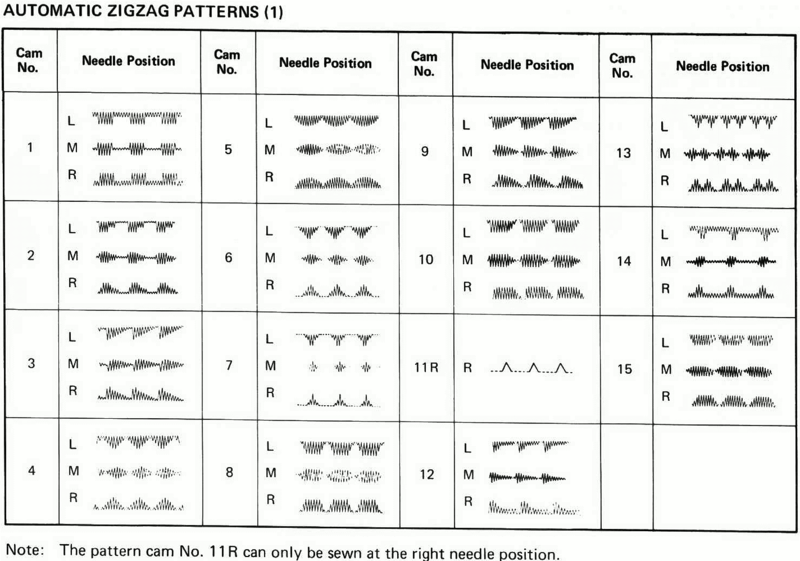 Compared to the modulated zig-zag method, we get less variation in a cam-driven system because the pattern remains the same when the needle position changes. However, we can get squashed patterns here, which is particularly useful for small stitched zig-zag. Machines with cam-driven zig-zag always need a zig-zag cam. Sometimes it’s built in and you have to switch between the zig-zag cam and “the other” cam, sometimes it is removable so that a pattern cam fits in its place. But either way, you need it in order to sew plain zig-zag. And then someone thought, hang on, why can’t I have both – an independently geared zig-zag mechanism, and cams to change the needle position automatically?​ But of course you can! Behold New Home 551 by Janome. These two scallopped stitch samples areactually different patterns. The upper one, when stitched without added zig-zag, produces single line scallops, whereas the lower one is designed for satin scallops sewn with zig-zag. However, adding zig-zag to the first scallop pattern pretty much produces the second. So why have two patterns? May be because the second pattern, which already starts out with zig-zag scallops, can produce much bolder (thicker) ones with extra zig-zag than the first one. But what if, instead of always making two steps forward and one step back, we could specify any back-and-forth pattern? And combine it with needle positioning, perhaps? The above cams are from Frister & Rossmann and Kenmore machines made by Jaguar. The top layer drives the feed (forward to reverse), while the bottom layer drives the needle position (left to right). Look at the right most cam: the feed can be driven in fractions, it is not a strict forward or reverse division, like in the left-most and central cam. The left cam just does the triple zig-zag stitch with a simple zig-zag pattern for the needle and the usual two forward, one reverse pattern for the feed. Both the needle position and the feed are switched between their extremes. The middle cam does a fancy zig-zag where some stitches are shorter than others, so the needle is placed at left, centre and right. The feed is still switched between two extremes (full forward or full reverse), but in a different pattern than for triple zig-zag: six forward, two reverse (worked out from comparison to the triple zig-zag cam). The right cam is a really fancy one. Both the needle position and the feed are driven into intermediate positions in order to make many little stitches along a curved line. Putting the feed into fractional positions simply means reducing its speed, it’s like working a stitch lever on old machines that goes from 4 to -4, where 0 stops the feed completely. The dogs are still moving up and down, so it’s not the same as drop feed, but they are not pushing the material in any direction. Some models also have a few cams built-in, for the most common utility stitches: stitched zig-zag, blind hem, that sort of thing, and it takes two-layer cams on top. This allows to use the feed drive pattern from the top cam with any of the built-in patterns. There are a lot of new possibilities now, but at the same time, only very few combinations actually make sense. You see where this is going, don’t you – instead of built-in cam stacks or boxes of external cams, we install a computer that controls a few levers to change the needle position and the feed, implicitely changing the stitch length with it. It all boils down to these two; any stitch at all can be produced with the needle position and the stitch length levers worked simultaneously. You’d need a few extra hands and unbelievable reflexes to do it manually for each stitch, but for a computer it’s easy. Memory Craft 6000 by Janome has an interesting combination of computer-controlled stitches with manual modulation. 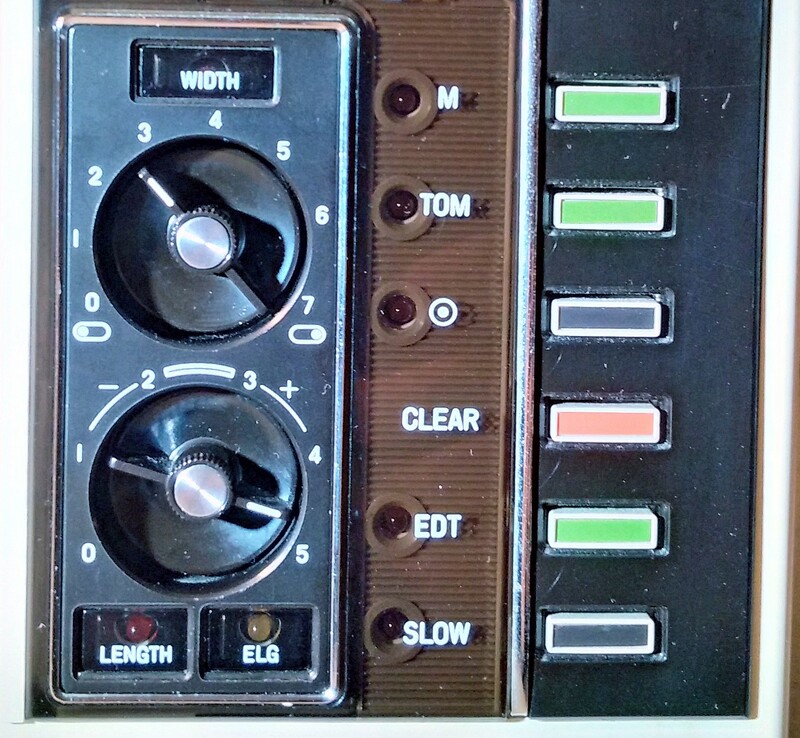 Both dials can be engaged or disengaged by pressing the central button. When disengaged, computer defaults are used which are actually very sensible, something you would normally set yourself. ​By the way, Janome’s New Home XL-II (900) can do it as well, with cams and gears only! Pattern elongation is done by altering the speed of rotation of the cam, so that the number of stitches per rotation is changed. But the coolest thing is yet to come. 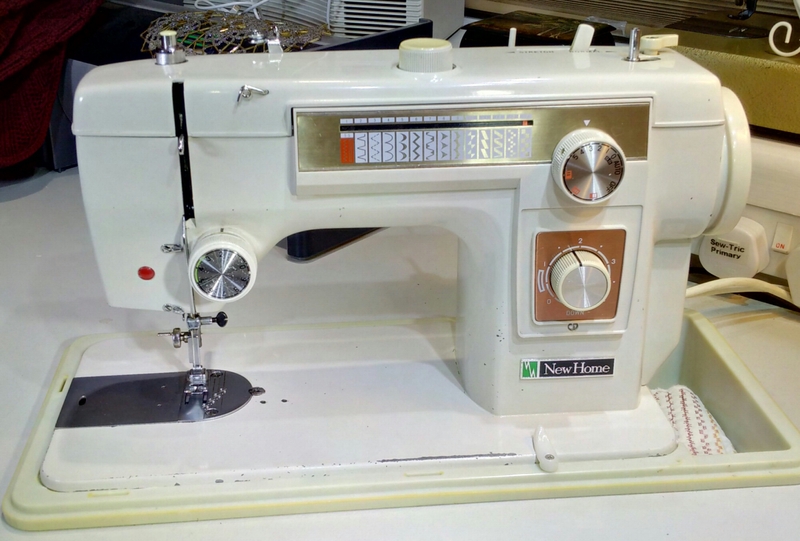 The manual controls in Memory Craft 6000 can be used continuously while sewing, similar to those old machines that only offer manually produced fancy stitches. That’s great because I can modify stuff as I go. But also, when storing stitches in memory in order to make combinations, they are stored with all their manual settings, so there is no need to “translate” anything into digital form. Those manual controls appear to be not so manual after all! Which system is the best? The computerised one, of course – I hear you say. Well, it certainly is the most flexible one with so many lovely possibilities. But it’s expensive, prone to failure, and once the electronics are gone, you lose the whole machine, it won’t even do your basic straight stitch or zig-zag either. So my Memory Craft 6000 is only going to be used for the fancy stuff, not regular sewing. Ok then, the next best thing: double layer cams that can do so many lovely stitches. That’s a great system, I agree, but you need a cam for absolutely everything, including plain zig-zag (unless the machine has a separate independent mechanism for zig-zag, like Haid & Neu Primatic). So if your machine has built-in cams only, the choice of stitches will be limited. The older models with other types of cam drives like the ones we started with in this post, offer fewer possibilities and cannot do really fancy stuff. But in return they allow to modify existing stitches in different, yet mostly sensible ways by adding independently driven zig-zag. And most importantly of all, should the fancy stitch mechanism fail either because its plastic gears crack or because you lose your box of extra cams, the basic functions of straight stitch and zig-zag will remain unaffected, and you won’t lose the whole machine. I’ll need to spend a bit more time reading your post to take it all in but just thought I’d mention that you can sew a variable zig-zag on my Horizon Memory Craft 15000. The width is guided by the knee lever – not that I have tried it at all! 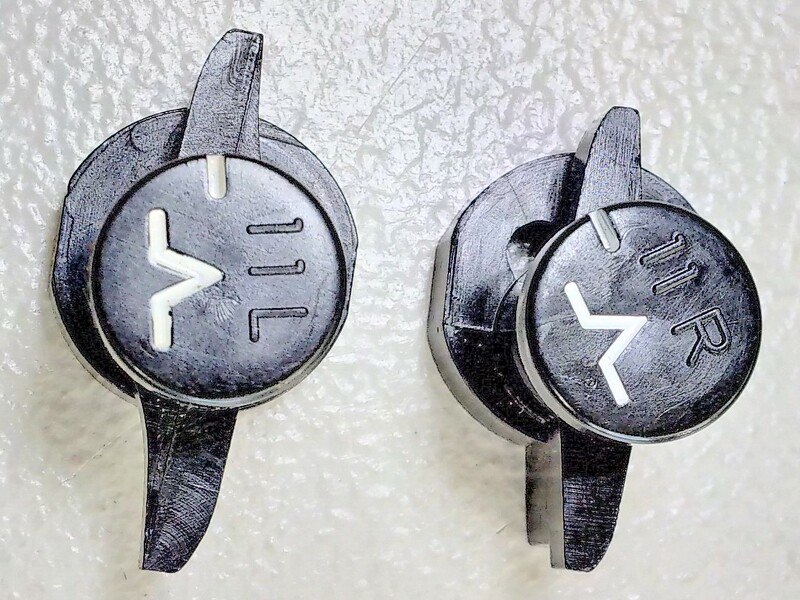 Did we talk about those Fashion Disks that fit the T132? My memory is not what it was. I’m currently a bit in capacitated having badly sprained my ankle on 2nd May – my dog bowled me over and I couldn’t walk for 4 days. It still hurts to press a machine pedal and drive, and still wearing a support! I paid to see a physio and seeing the doc tomorrow – hope I don’t get any bad news! Sorry to hear about your ankle! Fingers crossed, nothing is really damaged. Regarding the Singer Fashion Disks, yes, it was you who told me that they also fit the T132. 🙂 The same disks. I’ve also seen some other machines with the same disks, but don’t remember the makes now, possibly Adler or Anker, anyway German, I think. 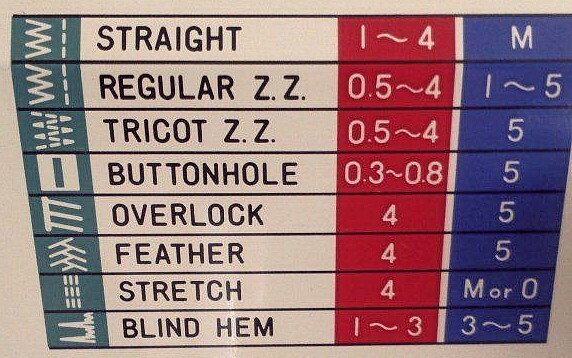 Must have been a popular design at the time. 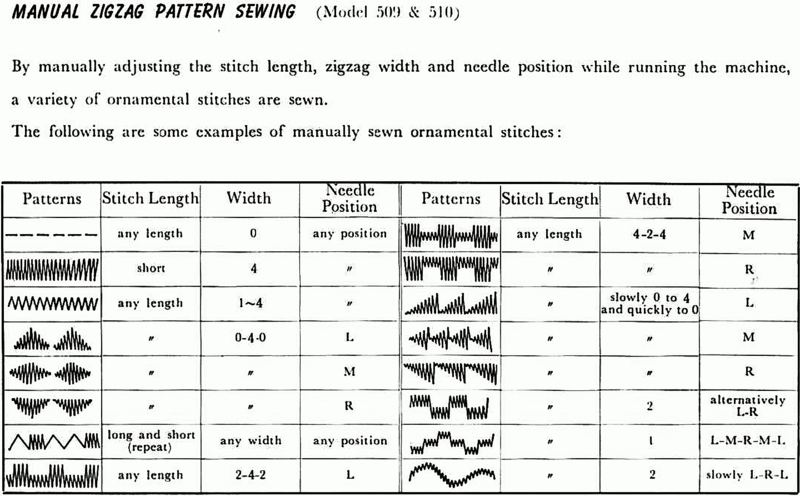 Wow this was so fascinating to see how fancy stitches are manually created on vintage models. Excellent piece, Elena, thanks – really well put together. 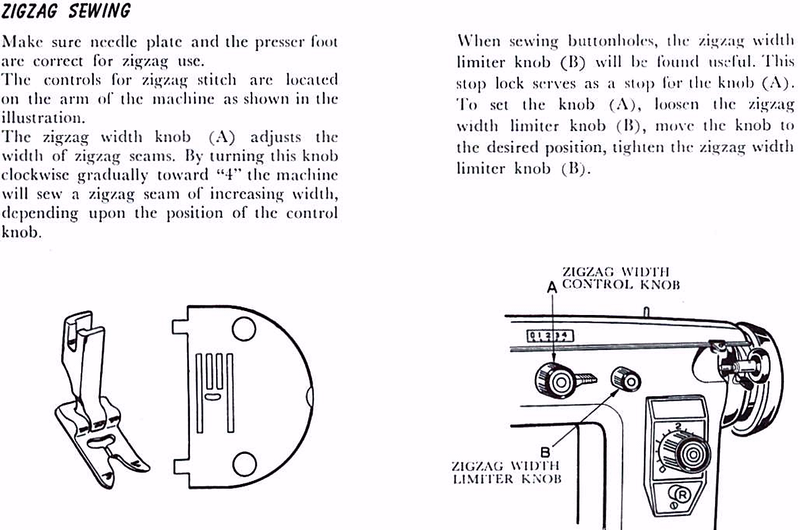 Vintage Necchi automatics have 3 cams for each pattern of course – one for needle position, one for zigzag width and one for stitch length and direction. Necchi were years ahead of the competition with that system. It wasn’t cheap though – the cost of more patterns on a computerised machine is just the cost of design and programming, although the top manufacturers seem to get away with megabucks charges for software. Thanks, Dan! I’ve never had a Necchi machine, but that sounds like a good design! 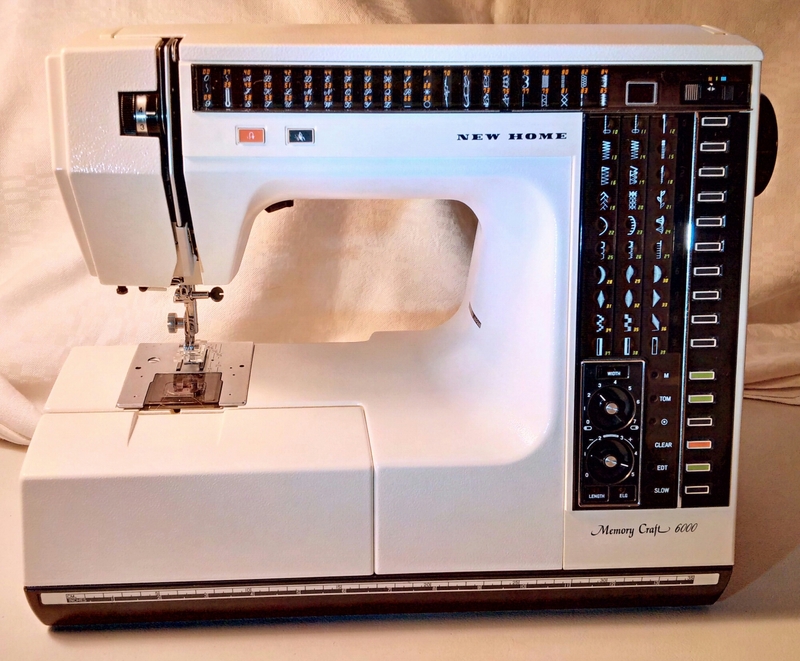 A lot of modern computerised machines do disappointingly few stitches – I’ve seen Brother and Janome entry models advertised as “computerised with a wide range of stitches – up to 32!”. Ridiculous. My 1960s New Home 551 with built-in cams does over 60 stitches by that count. 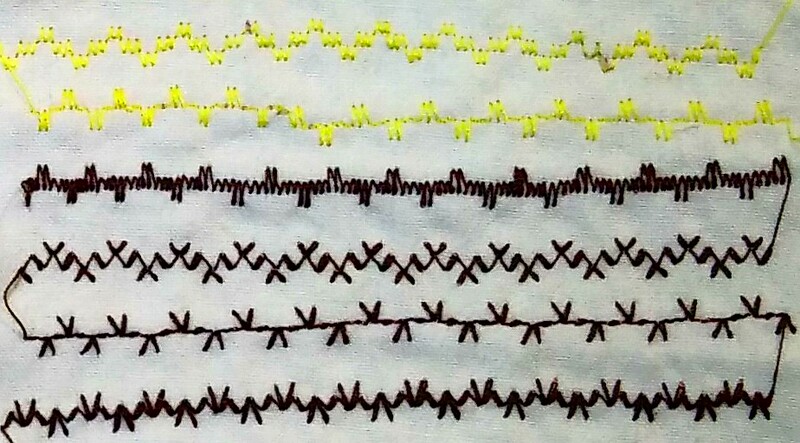 Brother now has a new system where the user can create new stitches: “My Custom Stitch”. Now, that sounds interesting! 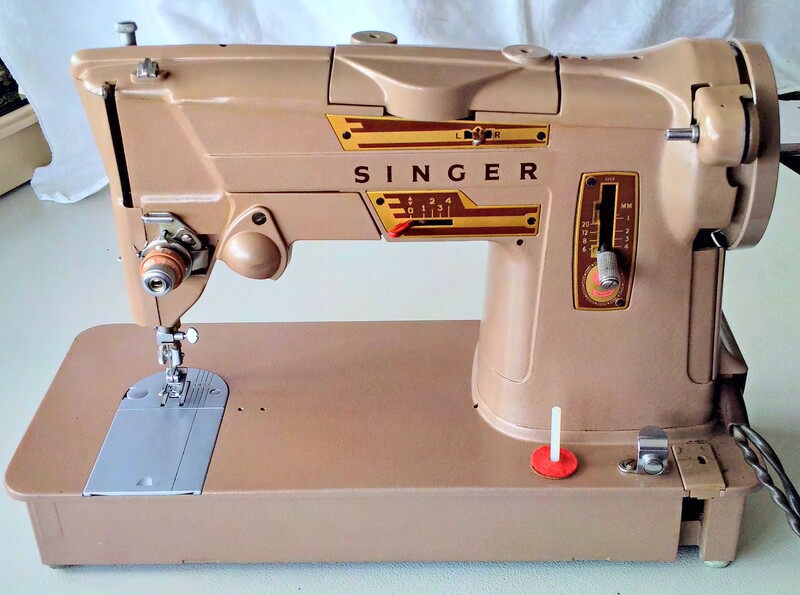 Vintage Necchi’s sound similar to your Haid & Neu / Harris machines – Class 15, with the bobbin case moving with the needle during zig zag, which gives the most fantastic satin stitches. Custom built cams with 3 different cams allows hundreds of options, although of course most look hideous and are not much use. Fun playing with though! Dan, Haid & Neu does indeed fantastic satin stitches but it is forward-facing, so the bobbin assembly is stationary for zig-zag. New Home 500 series by Janome is however side-facing with the assembly moving for zig-zag. They too make fantastic satin stitches. 🙂 Necchi sounds like a lot of fun, perhaps I should get one to play with. 😮 Which model would you recommend? I often see them on eBay. My Necchi is a Supernova Julia from about 1964. Necchi were no different to the other manufacturers – plastic gears started creeping in around the early ’70’s. My recommendation – if you can find one – would be a Supernova Ultra MkII, which will be an all steel drive. I think they look better than a Julia, but have nearly all the same features – rotating needle plate, cams, variable needle position, double needle etc. Ones in portable cases are likely to be in better condition than those from a cabinet, but they are best used IN a cabinet – which I see you do anyway. Machined to very close tolerances, they will seize if not looked after and used. Cared for like your nearest and dearest, they’re fabulous. If you are going to buy one I’d steer away from a “fixer upper”. Spares are hard to come by, so you want one that’s complete (including cams) and always had some TLC. Do you, by any chance have the instructions for the New Home 509? I was given a machine but no manual. Yes, it’s on my download drive – click on “Manuals to download” from the menu.